12 - Allied Community Newsletter Looks Great! 16 - Have a Spare Bike to Donate? On Wednesday, September 12, the long sought Dunn’s Marsh Neighborhood sign went up on the Beltline Frontage Road near Seminole Highway in front of the Midwest Financial Group building. It was the culmination of work that began when former President Dan O’Brien made it a goal of his in January 2008 to get a neighborhood sign. The sign idea progressed in fits and starts. First, the City of Madison gave too small a grant in 2008. A new application for a larger grant was turned down in 2009. A 2010 grant application was successful, but no location was found. Incorrect information in early 2011 lead the DMNA Council to believe we had lost the grant, but new information in early 2012 confirmed that we still had it. That knowledge and dogged persistence throughout 2012 brought the project to fruition. The Dunn’s Marsh Neighborhood sign was finally set in the ground by Cary Sign, LLC eight months after the final push. Two activities remain: planting the wildflowers around the sign - scheduled for Saturday, September 29, 1:30 pm - and making the final report to the City. Below are some congratulations the DMNA has already received about the new neighborhood sign on the Beltline Frontage Road. Congratulations on the sign! That is a big achievement. I have recently moved to Hudson, WI after 11 great years in the neighborhood…. Thank you for all of your work keeping us informed of neighborhood activities. Thanks for sharing! The sign looks great. Beautiful!! Thank you for making this happen!!!!!!!!!!!!!!!!!!!!! AWESOME! It's nice you are finally recognized as a neighborhood with this sign. It’s bigger than I thought it would be. I saw it tonight coming back from Milwaukee - I did a bit of double take coming over the Seminole bridge and turning - couldn't quite remember seeing it there before ... It looks great! Very nice! I’m sure it seems worth all the work & red tape it took to get it. Good lord, but Madison moves slowly --congrats! Plus “Likes” on Facebook from Gigi Millar Solari, Carol Poole, Solare O’Brien-Brethorst, Sandra Graham, Sandra Finn, Kerry Beheler, Anne Lundin, Anne Urbanski, Karen Deaton, Lynn Pawelski, Daisy Peterson, Mike Briggs, Laura Riggs, Linda Daly, and Connie Jensen. A series of photos were posted on Facebook as well as a “status report” about the sign. Most of these people are neighbors, former neighborhood residents, or current visitors to the neighborhood. In addition, Shawna Cain, DM Council member in 2007-2008, happened to pass by as the sign was going up. Shawna has lived elsewhere in Madison for a few years and is now moving to Florida. She was wowed by the sign and stopped to congratulate us and take a photo. · Former DMNA President Jeff Glazer who wrote the current grant. · All the current Council members who voted to proceed with the sign in 2012. · Thea Bach who learned that we still had the grant and passed on her discovery and opinion that we should go for it. She also attended the first meeting with the City, and then served as our contact with Mark and Krisanne Miehe who own the Midwest Financial Group business at the corner of Seminole and the Frontage Road. · The Miehes who were amenable to locating the sign on or near their property. It’s actually located on the City right-of-way. · Kent Seeker, Susan Kilmer, and Mary Mullen who served on the Sign Committee. Kent took part in meetings including several on site, and he will help maintain the plantings around the sign. Susan designed the planting, marked the exact location, and is overseeing the planting party. Mary shepherded the sign through City procedures as well as working with siting. 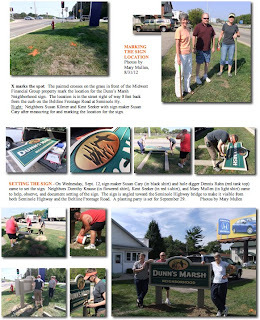 · Bob Hague also attended a City meeting where sign approvals were considered, and Dorothy Krause did some photoshopping for the sign permit as well as helping during the setting of the sign. Put on your blue jeans, gather your gardening gloves, a garden trowel (if you have one), and your smile, and come on up to help plant wild flowers around the new Dunn’s Marsh Neighborhood sign on Saturday. The planting party will gather at the sign on Saturday, September 29, at 1:30 p.m. to put in over 100 native plants and then place mulch around them. Kids are just as welcome as adults. Parents, consider what this might mean to your child every time you pass the sign in the future. Rain date is Sunday, September 30, at 1:30 p.m. There will be plenty of good will to go around, introductions to all present, photo ops, and maybe even a smidgen of history about the sign as well. Be a part of history. Join us. Neighbor Susan Kilmer, who works with native plants at the Arboretum, will be organizing our planting work. 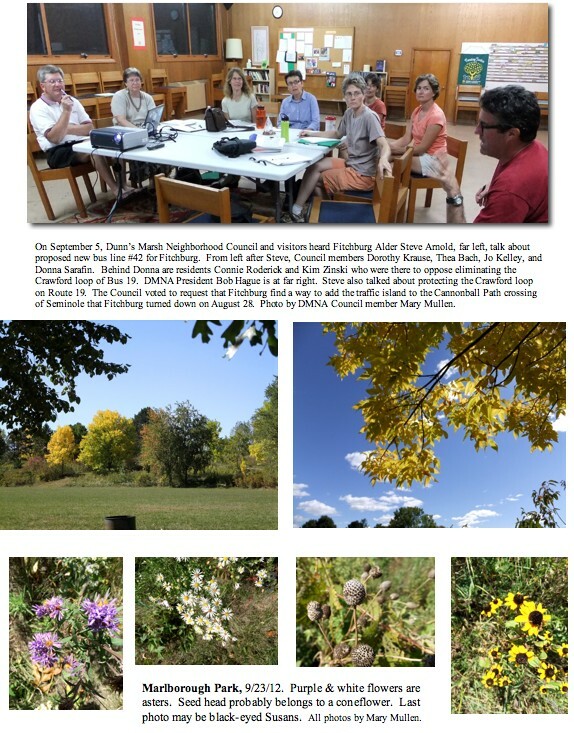 It’s several weeks away but not too soon for thinking about our Dunn’s Marsh Neighborhood Association Annual Meeting. It’s set for Wednesday, October 17, at Prairie UU Society, corner of Crawford and Whenona. The doors will open at 6 p.m. so people can come and peruse all the displays. The meeting will start at 6:30 sharp. There’s always a big block of time set aside for people to bring up their ideas and concerns. Put the meeting on your calendar now, and look for more details of the agenda in the next e-News. Bylaws are living documents that need revising to reflect changes in conditions and how an organization operates. At its September meeting the Dunn’s Marsh Neighborhood Council recommended two major changes and a set of minor rewordings to its bylaws that hadn’t been revised since 2009. DMNA members attending the annual meeting on October 17 will vote on whether to accept these changes. Changes are described below. See the exact wording in the attachment. The first change would be to include the lands around Dunn’s Marsh in the DMNA service area. Now our southern boundary is the Cannonball Path. However, since its beginning in 1973, the Association has been very active in protecting the marsh. The other major change concerns committee leadership. The change is necessary due to previous changes in the bylaws. The bylaws now state that committee alternate chairpersons can vote on the Neighborhood Council in the absence of the primary committee chair. Join us for the 1st Annual CAC Garden Days! We invite you and your family to visit one or more of the 10 different gardens hosting events from Friday, September 28th-Sunday, September 30th. We encourage you to bring your friends and neighbors to learn about the different types of garden programs that exist in the greater Madison area. See the schedule of events to find out what’s happening in your neighborhood. Tour Marlborough, one of Madison’s most diverse community gardens, and enjoy tacos, kid’s games and activities, and neighborhood chickens. Bring your questions for the “Ask a Master Gardener” station and attend the garlic planting demonstration. Nine other community gardens are participating in the Friday through Sunday weekend event to educate, share, and celebrate gardens. Are you a gardener swamped with fresh produce from you garden such as tomatoes, zucchini, Swiss Chard or other greens? Or are you afraid you will be just before the first frost? Here are some of the closest places to the Dunn’s Marsh Neighborhood that you could donate to. Call ahead to see when these places are open. Late on the night of September 5, I kept hearing what I thought might be police radios or walkie-talkies. No footsteps, but just constant talking on something electronic. Were police searching the streets and yards around my home looking for criminals? Hmmm… I kept listening but couldn’t make out any words. Finally, I decided to venture out to the street to see what I could see. Nothing. But I could still hear talking. Then it dawned on me. Maybe American Transmission Company was at work on their high voltage line project that extends both ways down the Beltline. I jumped in my car to explore. That late at night I didn’t feel safe on a bicycle. Sure enough, up at the Beltline/Verona Road intersection I came upon a beehive of activity. Orange cones filled the frontage road, guys in reflective yellow vests swarmed on the street and in the empty lot that used to be the Highlander Motel, spotlights there illuminated the pole, and a crane stretched over 100 feet in the air. The crane held a basket where a man was working with the pulleys and ropes that will be used to string the conductor wires. The voices I had heard and continued to hear as I surveyed this scene were apparently between the man in the basket and his handlers on the ground. I tried to get some pictures, wondering if the lights were bright enough. Late on the next day, as I came home from errands, I caught a better picture. Did you catch the action with all the cranes and trucks halfway down toward Todd Drive right after Labor Day? 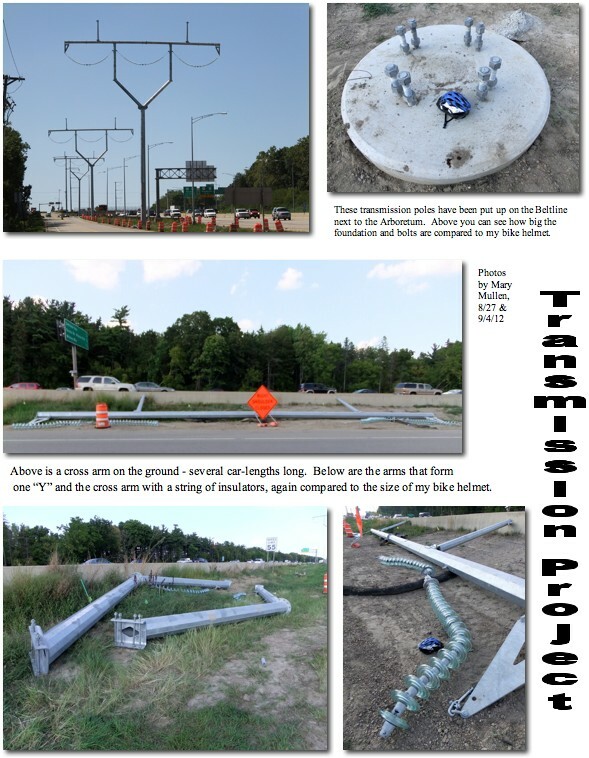 American Transmission Company (ATC) was taking down some of the large metal poles it had put up earlier in the year. Why? Short answer: they were lowering the height of the towers that will hold high voltage electric lines. The poles were originally intended to be low enough to protect birds flying from one part of the Arboretum to the other and to keep the lines from being visible from the Arboretum. Once they were up, it was clear that many could easily be seen from the Arboretum Visitor Center and the parking lot adjacent to it. Obviously, birds would be more likely to fly into them as well. Jon Callaway, a spokesman for ATC, said that 3 or 4 of the poles need to be lowered. Height will be cut by 10 to 30 feet. You may have wondered what happens to all the trees that have been cut to make way for the ATC 345 kilovolt electric lines going up along the Beltline. A spokesman for ATC, Jon Callaway, noted that a lot of the wood goes to a good use. The landowner is given the choice to keep the wood. If the landowner doesn’t want the cut trees and/or wood chips, the contractor can sell it or give it away. Excess wood, “junk wood,” and wood from diseased trees - think ash trees infected by the emerald ash-borer - does go to landfills. Trees are cut within 75 feet of the centerline of the wires resulting in a 150-foot swath of clear-cutting. Don’t be too shocked when you see the nice strip of trees being cut down along the Odana golf course. They are “in the way” of this project. This may happen around November 1. Callaway mentioned that ATC will be working with the City of Madison to plant vegetation further in on the golf course. A couple of months ago, I was invited to be a contributor to Madison Commons, a website associated with the UW School of Journalism. Now the public in general can see a 22-photo slide show of American Transmission Company’s high voltage project that passes by the Dunn’s Marsh Neighborhood and the UW Arboretum. Just go to http://madisoncommons.org/?q=node/1443 <http://madisoncommons.org/?q=node/1443> and click on the Environmental section to find the article. By experimenting, I found that I could view the slide show in many different ways: as a slide show with small photos, all the photos at once on the screen, larger with the captions similar to Facebook, and full screen. The article that goes with the slide show is reprinted below. Click on the links to see other articles about the transmission lines. 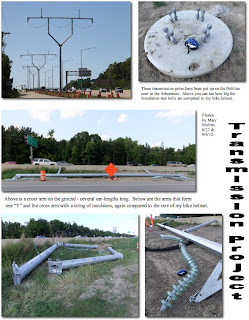 This August, the American Transmission Company (ATC) finished putting up new towers that pass the Arboretum and the Dunn’s Marsh Neighborhood along the West Beltline. The new high power lines <http://www.channel3000.com/news/Beltline-Transmission-Line-Project-Nearly-Complete/-/1648/10371698/-/5n9a9c/-/index.html> will carry 345 kilovolts of bulk electricity from a substation in Cambridge to another in Middleton. Power is distributed to customers from the substations. ATC identified the need for the project in 2002. Construction started last fall, and the system is expected to be operational in the summer of 2013. Neighborhood residents, and many others <http://uwarboretum.org/news/singlePost.php?id=319&amp;origin=foa&amp;activeCategory=12> , objected to the overhead lines, preferring buried lines or none at all. The poles stand 90 to 150 feet tall, dwarfing everything in sight. Other issues that remain include a hum of up to 60 decibels in humid weather -- equivalent to heavy traffic at 300 feet -- electromagnetic fields, and clear-cutting of wooded areas in a swath 150 feet wide. After Labor Day, ATC began work to lower 3 or 4 of the poles along the Beltline between Todd Drive and Seminole Highway, because they turned out to be too visible from the Arboretum. The whole idea of lower Y-shaped poles along the Arboretum was to keep the horizon clear and protect birds flying from one part of the Arboretum to the other across the Beltline. 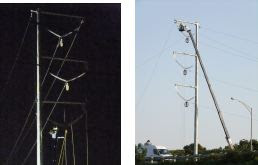 Explore the slideshow below to see the installation and adjustment of these towers. Recently, I received a pdf copy of the second issue of the new Allied Community Newsletter. I’ll have to say I was totally impressed. It is a snappy looking publication with a 3-column format, 9 pages long, and full of photos and interesting articles focusing on the Allied portion of the Dunn’s Marsh Neighborhood. Among other things, I learned about the GEMS group (Girls Empowered by Motivated Sisters), the TOPs program (Teens of Promise), Mothers in the Neighborhood, and the Welcomers group. The Allied Welcomers were the inspiration for the Dunn’s Marsh Neighborhood Association’s Welcomers although our Welcomers Committee operates a little differently. As I understand it, the Allied Community Newsletter is a joint effort of the Allied Dunn’s Marsh Neighborhood Association and the Allied Community Cooperative. It comes out 4 times a year. It is 2.3 MB in size. The West Police District puts out a newsletter every month or once every two months. Usually there’s some news about our neighborhood. The column specifically about Allied Drive is printed below, but you might be interested in reading the whole newsletter. On that site you can also sign up to get the West District newsletter directly. The Allied Drive neighborhood fell victim to the uprising of violence throughout the city this summer. On August 25th, at 4:09 pm, gunshots rang out on Revival Ridge Rd. The shooter(s) involved in this dangerous incident showed total disregard for the safety and the quality of life for those who reside within the community, as well as the numerous children playing outside. Actions such as this have been something that the Neighborhood Officers and the Madison Police Department have worked very hard to prevent. It is imperative that we get these people off the streets and keep those like them out of the Allied community. We are asking for everyone’s assistance in keeping the Allied / Dunn’s Marsh Community safe and free of this violence. Many stakeholders have been silent for far too long about incidents such as this. We all need to work together to solve, prevent and deter crimes in the community. On a lighter note, the August 2 6the backpack giveaway event at the Boys and Girls Club went very well. There were many volunteers assisting and even licensed hairstylists braiding, styling and cutting children’s hair. Many children signed up to begin attending the Boys and Girls Club. The parents and children were all happy and enjoying their time at the event. There was also an event on August 25th put on by the Mothers in the Neighborhood, which had a pretty good turnout. The women involved in this group are out to get mothers involved in what the children in the community are doing in hopes of reducing the number of teen pregnancies, and assisting the community maintain activities for families. Remember, together we can keep the neighborhood and community safe with a high quality of life. Although at its August 28 meeting the Fitchburg City Council turned down the idea of a ped/bike refuge island where the Cannonball Path crosses Seminole Highway, Fitchburg will now take a second look at authorizing the island there. Pedestrian-activated lights at both the Cannonball and Capitol City Path have already been approved.. The first stop for the new resolution authorizing both the island and the lights was turned down by the Fitchburg Board of Public Works on September 17. One member opposed it because his son is afraid of being on islands. The other opposing member didn’t say why he opposed it although it seemed that perhaps he didn’t like the fact that an alternate bid for electric conduit along the path was not included in the new resolution. A third abstained without giving a reason. The fourth, Alder Swami Swaminathan, is now very much in favor of both lights and the island and will vote for it on the Fitchburg City Council. During the first round, he abstained from voting on this matter. Resolution R-88-12 is different from the first resolution in that it does not ask for an alternate bid for laying electric conduit along the path for future lighting, and it adds pedestrian-activated lighting at both the Cannonball and Capitol City crossings of Seminole. The island was in the original resolution and remains in this one. The revised resolution will be at Fitchburg Public Safety and Human Services on Oct. 9, at Transportation and Transit on Oct. 11, at Finance on Oct .23, and finally at the Fitchburg Common Council on Nov. 27. At the Board of Public Works, four people registered in favor of the revised resolution. The three who spoke were Bill Hauda who wears many hats related to bicycle paths including serving on the Governor’s Non-motorized Recreational & Transportation Council; Dorothy Krause, Fitchburg Alder who originally proposed the flashing lights at the August 28 Fitchburg Council meeting; and Mary Mullen, speaking for herself and the DMNA. Two people had written letters of support: Donna Sarafin for the DMNA, and Tony Fernandez, City of Madison Engineer who has worked on the Madison portion of the Cannonball Path. In the past, Madison had a weight limit of 8,000 pounds for trucks using Seminole Highway, but Fitchburg did not. That discrepancy was remedied this September 11 when Fitchburg passed an ordinance that matches Madison’s. Fitchburg Traffic Engineer Ahnaray Bizjak will be in contact with Madison authorities to coordinate enforcement issues. Ms. Bizjak would also know the timeline for installation of signage on the Fitchburg portion of Seminole Highway. This new weight ordinance affects the portion of Seminole Highway running past the Dunn’s Marsh Neighborhood. Does anyone have an adult bike in good working order that they are willing to donate to some Bhutanese refugees in our community so that they can have transportation to their gardens, shopping, and work? I was introduced to a group of 6 wonderful men this summer who needed community service hours so that they could earn a bike from Wheels for Winners. I agreed to transport and supervise their work at Vilas Beach removing weeds at access points of the lake and cleaning up the park. After many weeks of hard work they earned their 15 hours of community service making them eligible for a free bike. However, when we went to pick out the much sought out bikes we found that Wheels for Winners, an organization that has been in operation for 20 years, is in dire need of volunteers and had no adult bikes in good condition available. This was very disappointing for these young men. I thought I would reach out to our neighbors hoping to find some bikes that might not be needed. If you have a bike in good working order and are willing to donate it please contact me at 695-7851 (cell) 238- 7177 (home) or send me a note by email debileep@gmail.com. I will make arrangement to pick it up and pass it on to our friends who have helped out our neighborhood. I will also be glad to put you in contact with the recipient of the bike, if you would like. Neighborhood dad Brandon Swanson has started a blog called “dadsarenotmoms.” We think you might find it interesting. Brandon’s first posting hit the web on 8/17/12. It has a nice photo of him and his son Elliot. Here’s the first paragraph. The creation of this place is inspired by fatherhood. I became a father in May of 2011. When my wife and I met with our mid-wife, Ingrid (of course her name is Ingrid, right? ), for the first time I asked what sort of books or resources she would recommend for a new father. Her response surprised me. She is a professional in the field of 15 years who is up on every birth and parenting publication around and she said “write one!” I concluded that this answer was indeed an honest call, almost a desperate challenge to write something that could explore the experience of fatherhood in a sincere and non-biased way. Sadly, a long-time but young (age 50) resident of the neighborhood passed away September 14. He was Paul Culp who lived on Lumley Road for many years. He died due to complications from liver and kidney failure. Thanks to Sharon Flinn for sharing this information. At the September 5 Meadowood Neighborhood Association Board meeting Ace Hardware owners, Denny and Sharon Lochner, were present. They were there to respond to statements made by the Mayor at a recent landlord meeting that they were thinking of closing. At the board meeting, members offered their assistance on finding ways to keep Ace Hardware in the Meadowood Shopping Center. It was a very good conversation around the issues the neighborhood faces, the issues around what a business faces in these tough and challenging economic times and an offer to work toward keeping Ace in our neighborhood. "...after studying financials, consulting with accountants and retail specialists, after exhausting all possible avenues, and coming to terms with our own emotions, we realized that we must close Meadowood Ace Hardware. It was not an easy decision. We've been faced with this possibility for three years. We held on longer than was probably financially sound. But we did stay because of our hope and commitment to the neighborhood, our customers, and our employees. Meadowood Ace Hardware has given us 25 years and 4 months of life. Our children grew up here. We watched your children grow up. We got to know each other and we shared stories, problems, solutions, and experiences. The next few weeks will be difficult ones as we say our goodbyes. We will be open for business as usual through Sunday, September 16. We will be closed on Monday, September 17, and Tuesday, September 18, to prepare for the closing sale. We will reopen on Wednesday, September 19, with a closing sale. Our target is to close no later than November 3." I am sure you join me in my disappointment that Ace Hardware is closing and that we are losing in essence a neighborhood friend. However it also opens up opportunities to think outside the box and come up with solutions. from Lisa Veldran, President, Meadowood Neighborhood Associ. Let me tell you about the improvements we’re making to promote water conservation and modernize our system. Madison Water Utility workers and our contractors have begun installing new meter reader radio transmitters in every home and business in the city. This “Project H2O” will automate water meter reading through a fixed-base radio network that will bounce radio signals to our information headquarters rather than to trucks driving around or to meter readers on foot. This modern technique will increase accuracy and give you the timely information that will help you to better manage your water usage. Our current Read-o-Matic meter registers (located on the outside wall of your home) were first introduced to the market in 1958, are now obsolete and no longer being supported by the manufacturer, so this technology implementation is necessary. It will be a catalyst for significant improvements in water efficiency and customer service. A few Wisconsin communities are already using this kind of system, and they are becoming more common throughout the country, from cities as large as Detroit to small suburbs. When installations are complete, you will be able to check your daily water usage online. Measuring system water loss more accurately will enable us to do the best possible job with infrastructure improvements and future capacity planning. The new system will also enable us to switch from a six-month billing cycle to the more common monthly billing that most other utilities use. Usage will be shown in gallons rather than cubic feet, making bills easier to understand. · Meter Installation Schedule: http://www.cityofmadison.com/water/programs/projectH2O/ <http://www.cityofmadison.com/water/programs/projectH2O/> <http://www.cityofmadison.com/water/programs/projectH2O/ <http://www.cityofmadison.com/water/programs/projectH2O/> > to find out when meter installations will be occurring in their area. The Madison Water Utility is holding one more public event to present information about Project H2O - Smart Metering for a Sustainable Future. The last open house event will be on Thursday, September 27, 6-8 p.m., Alicia Ashman Public Library, 733 N. High Point Road. The City-wide meter project, which has begun and will continue over the next year, will automate water meter reading to increase accuracy and provide customers with the timely information they need to better manage their water usage. Because the project will enable a transition to monthly billing, rather than the current six-month billing, customers and the utility will be able to detect leaks much quicker and save hundreds of gallons of water through quicker repairs. Hourly water consumption data will be made available to interested customers through a web application. Information will be presented in an open house format and will cover utility infrastructure (wells, pumps, reservoirs, mains, and equipment), rates and billing, wireless technology, a display of the new meter equipment, conservation, water quality issues, the installation process, the linkage to the City sewer utility, the utility water wagon, and a kids activity table. For more information about the program, please visit our website at www.madisonwater.org <http://www.madisonwater.org <http://www.madisonwater.org> > . 1. Love Your Lakes, Don't Leaf Them Campaign, September to November - Fitchburg City Hall (5520 Lacy Rd) - Stop by Fitchburg City Hall to view a special display cabinet (created by Mac Olsen and Dan Fourness) describing tips on keeping leaves and grass clippings out of the street (and storm system) and using them as nutrients in your yard and garden areas. FREE Yard signs, beverage coasters, and DVDs with information on the Love Your Lakes, Don't Leaf Them are available in the Main Lobby. 1) Fitchburg's Yard Waste Collection Update - guidelines and what happens to the leaves after they 'leave' your yard, 2) Campaign to reduce single-use, non-recyclable plastic bags in yard waste collection, 3) Fitchburg's Organics Collection Pilot - A Progress Report, 4) Comparing Fitchburg's 2009 and 2012 Waste Sorts, 5) Fitchburg's participation in the "Love Your Lakes, Don't Leaf Them" Campaign, 6) New efforts to increase Home Composting and reduce chemical fertilizers on Fitchburg's lawns, 7) 'PANR' - A project to manage and recover farm-utilized nutrients (N & P) at the Dane Community Anaerobic Digester, and 8) Update on the Yahara WINs project to install agricultural best management practices (BMPs) and quantify reductions in sediment and phosphorus loading to the watershed. **Also: Up to 2 Free yardwaste polybags will be available for residents participating in Fitchburg's curbside refuse and recycling program. 4. Fitchburg's Fall 2012 Electronics Recycling (Surplus-IT's warehouse - 901 Watson Ave. - 7:30am-11:30am) & Shred Day Event (Oak Bank's Parking Lot - 5951 McKee Road - 7:30am-10:30am) - Sat., Oct. 20th - visit www.city.fitchburg.wi.us <http://www.city.fitchburg.wi.us> for more information as this event approaches. 6. Our "Fitchburg_Green" E-News Mailing List is up and running. Blind copy recipients will be excluded from future "Fitchburg_Green" E-news Blasts unless you subscribe to the "Fitchburg_Green" Mailing List following the directions below. The Fitchburg Optimist Club and the City of Fitchburg Park and Recreation Department would like to invite you to a Thursday, October 11, 2012 informational meeting in which the proposed Splash Pad at McKee Farms Park will be discussed. McKee Farms Park is located at 2930 Chapel Valley Road, just south of McKee Road (Co Hy. PD). The informational meeting will be held in the Stoner Prairie Dining Room in the Fitchburg Community Center, 5510 Lacy Road starting at 7:00 p.m. and will provide an opportunity to gather input on design of this project. Your presence at this meeting will be much appreciated. This project is being proposed in the 2012 City budget. The Common Council will consider this project during its 2013 budget debate on November 13, 2012. If you are unable to attend and have questions or comments regarding this project, contact Joan Mohr, Splash Pad Chairperson, Fitchburg Optimist Club at joaniemohr@gmail.com or Scott Endl, Parks and Recreation Department, 270-4288, or soctt.endl@city.fitchburg.wi.us . Thank you in advance for your support in this very worthy community project. REGISTER <http://www.cityofmadison.com/neighborhoods/neighborhoodconference/ <http://www.cityofmadison.com/neighborhoods/neighborhoodconference/> > today for the city-wide Great Neighborhoods - Great Places Neighborhood Conference on Saturday, October 13, 2012 at Monona Terrace Community & Convention Center! Inspiring Keynote Speaker, 20 Workshops, 100s of Neighborhood Leaders. The 2012 Mayor’s Neighborhood Conference is a wonderful opportunity for neighbors to learn, share and network. We are excited to have Fred Kent <http://www.pps.org/about/team/fkent/ <http://www.pps.org/about/team/fkent/> > , President of Project for Public Spaces <http://www.pps.org/ <http://www.pps.org/> > (NYC), as our keynote speaker. Fred will talk about the great places – if it is a city or a neighborhood – needs to offer at least 10 things to do or 10 reasons to be there. Whoa, do you have a favorite/least favorite place? Share <http://www.cityofmadison.com/neighborhoods/NeighborhoodConference/places/index.cfm <http://www.cityofmadison.com/neighborhoods/NeighborhoodConference/places/index.cfm> > with us what are your top favorite and least favorite places in Madison. Tell us why a particular place draws you in or keeps you away. While you're at it, snap a photo to spotlight the place you have chosen. We'll choose several neighborhood places to discuss in the workshops. Check the site often to see what others are posting – and remember you can post even if you aren’t attending the conference (but we wish you would join us). The full-day event is packed full of workshops <http://www.cityofmadison.com/neighborhoods/NeighborhoodConference/schedule.cfm <http://www.cityofmadison.com/neighborhoods/NeighborhoodConference/schedule.cfm> > covering a wide range of topics. Early bird registration: $20 by September 30th. Scholarships are available. We are grateful for the generous contribution from Madison Gas & Electric Company. Questions? Contact City of Madison Planning Division: Ruth Ethington at 608-267-8727 or Linda Horvath at 608-267-1131. Hispanic Heritage Month began on September 15. It’s the anniversary of independence for five Latin American countries--Costa Rica, El Salvador, Guatemala, Honduras, and Nicaragua. In addition, Mexico declared its independence on September 16, and Chile on September 18. The term Hispanic, as defined by the U.S. Census Bureau, refers to Spanish-speaking people in the United States of any race. On the 2000 Census form, people of Spanish/Hispanic/Latino origin could identify themselves as Mexican, Puerto Rican, Cuban, or "other Spanish/Hispanic/Latino." More than 35 million people identified themselves as Hispanic or Latino on the 2000 Census. Wow! You can’t turn on the TV without hearing dozens of advertisements about how bad this candidate is or, sometimes, how perfect that candidate is. The pollsters say that practically every voter has already made an iron-clad choice, but money pouring into the campaigns and that collected by the Super-Pacs has to be spent. Therefore all the sturm and drang is for a tiny percentage of undecided voters. If you are one of those, or you consider yourself open-minded or simply interested in what’s true about the claims, is there a place to go that can help sort out the truth from the chaff? Or would it be better to just dig a hole, bury your head, and hope things just turn out all right without participating in the elections this November 6? Well, of course you would guess that a poll worker and former League of Women Voters member would recommend learning more rather than becoming an ostrich. So here goes. One method to search for the truth is to listen to discussion and interview programs from both sides and try to discern a middle ground. I don’t find that method particularly useful. Sometimes the truth isn’t in the middle after all. Fortunately there are some easier options. For specific facts, one can check out http://www.politifact.com/wisconsin/ A rating meter with a comment underneath gives an instant answer, but it’s fascinating to go on to the more lengthy discussion of how PolitiFact arrived at its ratings of True, Mostly True, Half True, Mostly False, and “Pants on Fire” (outright lie). Sometimes you’ll find out that a negative ad is a true representation of the opponent’s record as seen negatively from a certain point of view, but that you, the voter, believe that the opponent’s so-called voting record or position is exactly what you prefer. Did you get that? In other words, for a case in point, you might feel that U.S. Senatorial candidate Tammy Baldwin has the right idea about health insurance even though ads for Tommy Thompson truly state her position but make her seem like the very devil for her views. I think these programs and sources are good even if you are pretty certain about your voting choices because you get a more realistic view of the opposing sides. Like humor? Still another way to get a dose of the news and some commentary on it is to watch Saturday Night Live, 10:30 pm on Saturday nights on NBC. Sometimes it’s good just to laugh. Surprisingly, listening to Seth Meyers’ “Weekend Update” can prompt a trip to the Internet to learn more about news I somehow missed. What’s the bottom line? For democracy to work, people need to vote from actual knowledge, so it’s the voter’s duty to be informed. Also, for democracy to work, people need to vote, period. If a majority votes ill-informed, the result will be not what they expected, or if a large share of electors don’t bother to cast a ballot, the other guy is going to choose who represents us all. “Click and Mail” is a series of web pages that help a voter enter the proper information to register, and then instructs them to print out, sign, and mail the form to their clerk. This is an excellent method for voters to change their address. It is much easier for the clerks to process than a handwritten form because the form will not print until all information is complete, and the data entered by the voter is uploaded to the Statewide Voter Registration System. On My Vote WI, the user must first select a voter category (usually “Regular Voter”), and then enter a name and birth date. After this, an option on the left side of the screen is “Register to Vote”, which leads to Click and Mail. The Government Accountability Board has launched a new website, called MyVote WI. It replaces Voter Public Access, and includes a new registration module, “Click and Mail.” https://MyVote.wi.gov This is an excellent source of information. October 9, 28 days before the election. If you move after this date, you vote at your old polling place, either in person or by absentee ballot. October 17, the end of open registration. Special Registration Deputies (SRDs) must turn in their forms by 5 pm, or have them in the mail and postmarked by October 17. October 22 to November 2, in person absentee voting at your clerk’s office. In order to vote, you need to reside for 28 days at a location. But you can register as soon as you move in to the new location as long as you will be living at that same address for at least 28 days prior to Election Day. First time voters who register with an SRD (Special Registration Deputy) do NOT need to provide proof of residence during open registration, which ends October 17. · If a person has a current and valid WI driver’s license they must place that number on the form. If their Wisconsin driver license is expired or revoked, they may use the last 4 digits of their Social Security number instead. · There is no longer straight party voting in Wisconsin, due to a provision in Act 23. The latest form is dated rev 6/2012 on the bottom left. Old ones may still be used. 1) Corrected the explanation of the difference between Driver License and DOT ID. Now, the instruction on page 2, for section 2 states, “If you have not been issued a WI driver license, you must provide either your WI DOT-issued ID number or the last 4 digits of your Social Security number.” The previous instructions were in error. 2) In section 1, changed "WI Address" to "Address Change." 3) Added to Section 3 a line for military or permanent overseas electors. 4) More space for the SRD to enter their name and number. Want to see the November 6 general election ballot for your polling place? The ballot you will get at the Madison polls will be quite similar, but the State Senator and State Representative candidates will be different because the Madison part of the neighborhood is different districts. Christopher Columbus became an icon in American history essentially for miscalculating. He accidentally bumped into a new world while trying to find another. Columbus had a goal. Although the United States celebrates Columbus Day on the second Monday of October each year - October 8, this year - Italian-born Columbus landed in the Bahamas on October 12, 1492. He was funded by Queen Isabella and King Ferdinand of Spain, who gave him three ships to complete his mission. Columbus believed it was possible to reach the mythical spice and gold of Southeast Asia by sailing west from Europe across the ocean instead of east across established and arduous land routes. What he didn't know was that another continent blocked his way. The wrong place at the right time. Columbus had an entirely different geographic goal, but no one can fault him for being the first southern European to establish a relationship with the New World and initiate centuries of exploration in the Americas. He was not the first European to reach the Americas. In the 11th century, the Vikings had established colonies in Newfoundland and Greenland. After Columbus' initial discoveries in 1492, he returned three more times over the next 10 years, all the while believing that he had found a faster route to the West Indies. Columbus never did find his ocean route to the Far East; however, he is credited with igniting Europe’s fascination with the new continent that paved the way for future conquests and colonization. Columbus almost didn’t live long enough to become famous. As a young man, he worked on a merchant ship that was sunk by French privateers. Thanks to a scrap of wood, he floated ashore and made his way to Lisbon, Portugal, where he became a student in mathematics, astronomy, cartography and navigation. An ambitious man, Columbus found a way to combine business with religion. King Ferdinand, Queen Isabella and Columbus were all devout Catholics. His business plan included his payment of 10 percent of whatever bounty he brought home, a noble title, and governorship of any lands he discovered. His benefactors enthusiastically accepted the theory that his explorations might also prove to be an opportunity to export Catholicism to other lands. Because Columbus never could deliver on his promise of gold, silver, spices and precious stones for Queen Isabella, he did bring her approximately 500 slaves. Instead of thanking him, she sternly rebuked his gesture and returned his gift, believing that any native peoples he discovered were already Spanish citizens. Celebrating Columbus Day. For Italian Americans, celebrating Columbus Day has significant meaning. An executive order is signed every year by the sitting U.S. president designating October as National Italian American Heritage Month with parades and festivities celebrated around Columbus Day. Don’t leave your old, unused, unwanted prescription drugs in the medicine cabinet. Don’t flush them down the toilet. Don’t throw them in the trash. Instead, take them to a MedDrop collection. The UW location is open only on Sunday, Sept. 28, but several others are available daily. Improper disposal of medicines can contaminate area rivers, lakes and streams. Medicines collected at the MedDrop locations are incinerated and disposed of in the most environmentally safe method currently available. To dispose of medications in the MedDrop drop boxes, please bring your unused or expired medication and a ziplock or other resealable bag to the MedDrop police department. Leave liquids, gels or creams in their original containers and place them in a ziplock bag as well. Put sealed ziplock bags into the MedDrop box. This is a list of items you can dispose of at MedDrop drop boxes: prescription medicine (pills, liquids and creams), over-the-Cocounter medicine (pills, liquids and creams), medications for pets, vitamins, medication Samples, nebulizer solution, and inhalers. Do not bring IV bags, oxygen tanks, nebulizer machines, thermometers, sharps, epi pens, or anything with a needle or lance. The main function of county government is to provide core services that residents depend on in their everyday lives. I’m proud to report that substantial public safety improvements that I included in my last budget are underway this year, helping protect the lives of our residents and first responders. This year the county will complete nearly $1 million in upgrades to our emergency warning system. The bulk of these improvements focus on synching our 125 outdoor sirens directly with weather warnings and storm tracking from the National Weather Service. This revolutionary change will ensure that outdoor sirens sound only in communities that are in harm’s way, instead of all the sirens in the county sounding at once, even in communities where the sun may be shining. Recently, I was joined by public safety officials to break ground on our new $18 million dollar emergency communications network, DaneCom. Once complete next year, DaneCom will seamlessly link emergency responders and public works officials – from sheriff’s deputies to snow plow drivers – on one ultra-modern radio network. With DaneCom, whether it’s a car crash or fire, tornado, flood, or blizzard, our first responders will be able to communicate with one another, helping ensure a speedy, well-coordinated response. This new radio system will expand emergency communications coverage in rural areas of the county, and includes a tactical system found no where else in country designed to make fire scenes safer for firefighters. Work also continues on a new high-tech system to ensure the closest responders are dispatched to emergencies first. This new “Computer Aided Dispatch” (CAD) system will help better link 911 dispatchers with fire, police, and emergency medical teams in the field. All of these public safety improvements will shave seconds off an emergency response time by increasing communication and coordination – and those seconds will save lives. Bus Rapid Transit (BRT) is being studied for the Madison metropolitan area. On Monday, September 10 a public meeting was held to help people learn more about BRT. 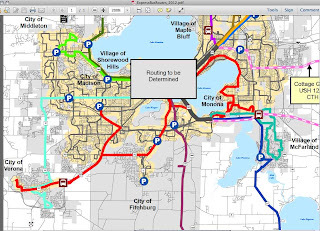 The Madison Area Transportation Planning Board (MPO), in cooperation with Metro Transit and the Capital Area Regional Planning Commission (CARPC), is leading a study to explore where and how to implement Bus RapidTransit (BRT) in the Madison metropolitan area. The study is part of the Capital Region Sustainable Communities (CRSC) Initiative led by CARPC. 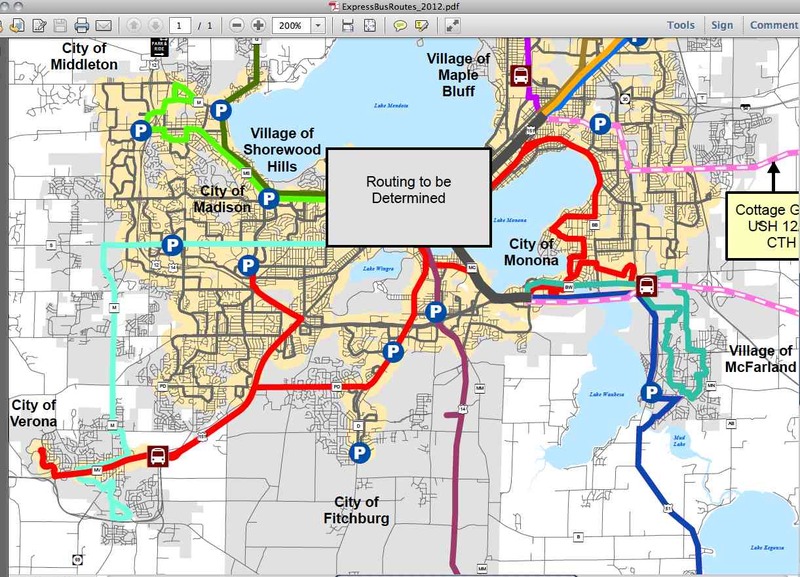 To see what the routes might be, click on the attachment, “Bus RT map.jpg.” BRT goes to outlying communities in Dane County.